Nigeria’s President, Muhammadu Buhari and the AGF, Abubakar Malami have been ordered by a court not to go ahead with the removal of Chief Justice of Nigeria, Walter Onnoghen. Justice Inyang Ekwo granted an order of interim injunction restraining President Buhari and the AGF from removing Onnoghen from office pending the hearing and determination of the suit filed by Action Peoples Party (APP). According to Channels Television, the Justice made the ruling at a Federal High Court sitting in Abuja, on Monday, January 21. The court adjourned the hearing of the motion on notice to the 29th of January with an order to parties to maintain the status quo ante. Hey Buddy!, I found this information for you: "Court Stops Buhari, AGF From Removing CJN Onnoghen". 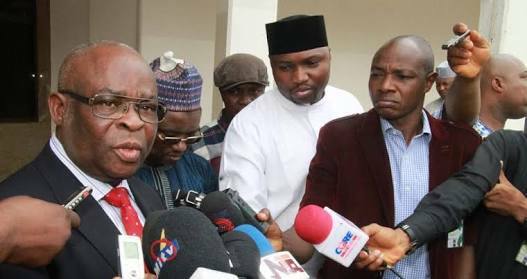 Here is the website link: https://headlinenews365.com/court-stops-buhari-agf-from-removing-cjn-onnoghen/. Thank you.